We’ve previously looked at The Fever of Urbicande‘s prologue (and some of its implications), as well as chapters one, two, three (in two parts), and most of four (parts one, two, and three). We now conclude our look at chapter four. As Sophie and Eugen ascend to the heights of the North Bank, the tension between their different personalities finds its clearest expression, if not its apex. Eugen, whom we may guess is neither happy with the ambiance nor the strenuous nature of the climb, whines that the upper reaches of the North Bank are “the foulest area of the city. The people live in the midst of a sort of perpetual fog.” As previously discussed, this isn’t fog at all, any more than the famous London fog was; it’s industrial pollution. No one says this explicitly, though we see plenty of bellowing smokestacks on the North Bank. Like “London fog,” the word “fog” is a euphemism that hides the truth. That’s not to say that Urbicande’s residents (like Victorian London’s) don’t understand the truth, however. Robick more than hints at it by preceding his comment about the fog with an observation about how the heights of the North Bank are the dirtiest part of the city. In the next panel, Robick continues, “I think that we would do best to turn back. 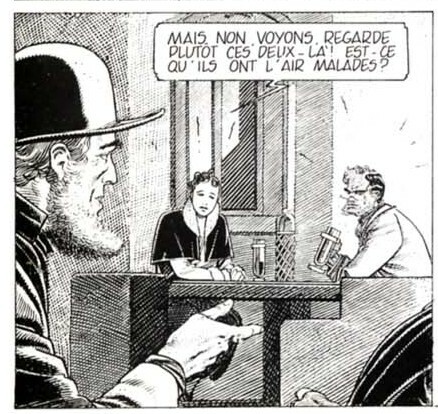 There’s nothing more to see here.” Always aware of body language, Schuiten here illustrates Robick looking back, holding his glasses in a pose reminiscent of an awkward professor, out of his depth in the real world. Here again, it’s worth pointing out that the environs hardly seem shockingly dirty, at least from our perspective. The wide staircase our couple ascends, with tall buildings on either side, looks positively charming, if not majestic. It is, to us, a fabulous city, to have such architecture at such great heights, as if the city is a pile of ancient buildings built on ancient buildings, until they reached skyscraper proportions. It’s hard not to wish that we were there with the characters, exploring this fantastic and idiosyncratic landscape, even if doing so meant braving the industrial pollution. In other words, Eugen may feel like he’s slumming, but the disorder he perceives in the North Bank’s architecture is actually quite charming. Schuiten’s panel composition, here and on the previous page, accentuate this. Both here and on the previous page, he places a reluctant Eugen in a tall panel, which literally accentuates the heights that the North Bank has achieved. The effect is to wow us with the architecture he presents, to make us feel like this is anything but an irredeemable slum that Eugen should tear down. At the same time, this composition also lets us identify at least somewhat with Eugen. We see the couple standing at a blind turn in the staircase, suggesting the possibility of ambush. Moreover, while the staircase is at skyscraper heights and may seem wide to us, it’s old and narrow by South Bank standards. The stone stairs are cracked, far from the smooth granite-like perfection of Eugen’s renovated South. And the vertical composition of the panel accentuates a sense of claustrophobia, with relatively unadorned buildings on either side of the staircase, suggesting that there’s nowhere to run — and nothing to see while climbing but the staircase itself. It’s a far cry from the openness of the South Bank, where the stairs are wider and often bordered by vast open spaces. In this way, Schuiten is able to communicate both the charm of the North Bank, despite Eugen’s complaints, and yet how his eyes could register fault. Such nuance is a rare thing, in the fiction of the fantastic, where awed, Spielberg-like faces tell audiences that they should have only a sense of childlike wonder at the impressive sights before them. Any sense of cultural relativism is ignored or obscured, in favor of communicating simple wonder. In such stories, there’s no place to admit that such an ancient, intoxicating landscape may also be poor and polluted, let alone compare unfavorably in certain respects to other architectural styles and the political regimes they represent. Consider the movie Avatar, in which the natural wonder of the politically dispossessed lacks any flaws and the fascistic elite is presented virtually without redeeming elements. Despite being in black and white, The Fever of Urbicande couldn’t be less stark in its implications. Her language might still seem passive, because she’s framed the debate in terms of their relationship, rather than his fear. But in fact, it’s his feelings for her that have led him into the North Bank in the first place. She hasn’t changed the subject; she’s cut right to the real, underlying issue. Given that his real interest is in Sophie and not the North Bank, Robick responds appropriately, reversing himself immediately. “You are right,” he says in the same panel, then adds in the next, “So let’s go! After all, I’ve been to the heights either!” He couldn’t have reversed course more severely, so much so that he now pretends to share her enthusiasm. If we had any reason to doubt, this is the surest sign yet that Eugen, despite his repression, has feelings for Sophie — enough to take him out of his comfort zone. He may protest, like a curmudgeonly professor, but the truth is he’d follow her anywhere. He may not know this, but we do. His reversal is a surrender, on his part. But it’s nothing compared to the surrender he’s about to make. Of course, this is information we know from the prologue, and we can guess why “work never got started”: the South Bank elite doesn’t have concern for the North Bank. To us, this seems obvious enough, so much so that Eugen seems stunningly naive about politics. But in a story in which the characters’ perceptions are not our own, we should also understand that this seems obvious only from our outside perspective. Many of us also live in cities in which funding goes to wealthy areas and ambitious new downtown stadiums while the poor neighborhoods crumble. Like Eugen, we rarely see our own cities and societies objectively, so perhaps we shouldn’t be too hard on him. In response, Sophie says, “Who knows, maybe it’s not so bad like this…” She does so while staring up at the old, haphazard buildings to her side. Her right hand extended, palm upright. Hers is an unassuming, even submissive posture, suggesting she’s open to the experience of the North Bank. Her open-palm gesture may even be read as noble or religious, almost like she’s bequeathing the city to us and the Eugen. Her words are a simple observation, offered without assertion of certainty. Yet they’re also the most direct challenge yet to Eugen’s entire architectural plan — and thus his entire worldview. Now, at the heights of “the famous North Bank” he sought to demolish, Eugen can at last acknowledge the challenge. He seems fatigued, even defeated. His plans for Urbicande’s revival, for which he fought so strongly as the story began, have no hope of completion. They don’t even have any meaning anymore. The government has effectively admitted its own inability to control the city. The network has changed everything. Through it and through Sophie, Eugen’s seen that disorder may have its own charms, its own benefits. He may think himself a solely intellectual being, but no amount of knocking down ancient buildings and replacing them with austere, ordered stone is going to erase his own emotional nature, his own lust that compelled him to stare through the window into Sophie’s building, nor the attraction that has drawn him across the river, through the kind of dirty, lived spaces that once made him recoil, all the way to the smoke-filled heights of the North Bank. As if she intuits the strain on Eugen and his need for a break, Sophie points out a cafe, nestled into the old buildings. It’s an odd construction, with circular outside eating spaces at different levels, in front of a building that seems to eschew right angles. In the foreground and to the side, smokestacks spit out more fog. In the background, an old archway seems to lead nowhere. It’s hard to tell where one building ends and another begins. It’s certainly nothing Robick would have designed. And through it all, the network that allowed this entire journey overlaps and penetrates everything. This isn’t, strictly speaking, true. But it expresses the deeper truth that she’s in the lead now, a fact to which he’s already assented. He may be used to prestige and power, but Sophie’s unambiguously in charge now, at least for the purposes of this tour of the North Bank. What’s more, this is clearly to Eugen’s advantage. Where has all his uncompromising intellect and personal repression gotten him? He needs this tour, and Sophie is guiding him well. That Eugen sits is, of course, another implicit admission — not only of his powerlessness, but of the bankruptcy of his life, as he’s been leading it. If Eugen’s frightened of the locals, there doesn’t seem to be any reason. The cafe’s host, who arrives to take their order, is a portly, smiling man who seems friendly and anything but threatening. We’ve already seen plenty of indications that the cultural differences between the South and the North are relative, but it’s here that we get the fullest one. But we get a close-up of the food in question because Eugen and Sophie are, for these three entire panels, sitting in the background. Remarkably, the focus has shifted away from them. Instead, in the foreground, we focus on another of the cafe’s quaint tables, where locals sit… discussing the strangeness of these two Southerners, exactly while those two Southerners discuss the strangeness of the local cuisine. He’s referring to the “perpetual fog,” which to him is normal. The notion of having sunlight in a way that we and the South Bank consider normal is, to him, impossibly foreign. Clearly, the North Bank has its own rumors about the South, exactly as the South does about the North. This suggestion wouldn’t have been possible before the network, when rumors were all either bank had. The network has changed everything. The North Bank has its own fear of the South, precisely as Eugen and the South has of the North. As he says this, he points at Eugen and Sophie, attracting their attention — and interrupting their discussion about Eugen’s fear of the local cuisine. Of course, that fear may be based on the idea that the house specialty will make them sick — precisely as the local man’s companion fears traveling to the South Bank will make him. Eugen and Sophie alert to the fact that they’re being talked about and pointed at. They turn, and thin wavy lines radiate from their head, indicating surprise. It’s a tense moment. And then, in the next panel, everyone laughs, dispersing the awkwardness. The table of locals erupt into laughter together. Sophie also laughs, turning back to Eugen. Perhaps this is only nervous laughter. But one can’t ignore the fact that it’s also the product of staring at the Other one fears — only to see them staring with the same fear at you. It’s hard not to read this laughter as an indication that everyone’s recognized that the Other they fear is human too, not dirty foreigners whose home or whose food is somehow contaminated. Difference hasn’t been erased here. But stereotypes have been admitted and at least had their power dispelled. And this hasn’t happened through intellectual argument, which Robick embodies. This has happened through simple experience. It’s happened through Sophie’s excitement at engaging with the new. It is perhaps because of this that Robick doesn’t laugh. He continues to stare at the other table, even while Sophie’s turned back to him. He doesn’t seem to pick up on the social cues everyone else does. Still, it’s hard to imagine that he too hasn’t benefited from this encounter. He may not be capable yet of laughing, of relaxing and enjoying himself. But there’s no avoiding that he’s had a powerful experience; he’s encountered the locals he so feared, and the episode ended in laughter instead of illness or violence. It’s a sublime sequence and a wonderful illustration of the power of stereotyping to induce irrational fears about a population one hasn’t, in fact, actually encountered. And of the power that actually experiencing that population has in dispelling this fear. No, this power isn’t total: both parties may persist in some stereotypical thinking, and Eugen remains at least resistant, by virtual of his disposition if not the strength of his stereotypical thoughts. But the sequence also illustrates the limits of intellect, despite its rightly celebrated place. 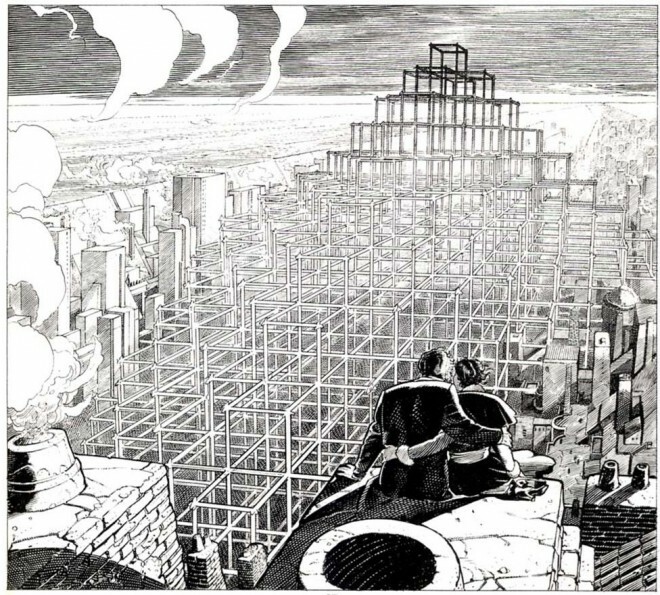 After all, Robick is not only the protagonist but the urbatect, in a graphic novel that’s in love with architecture. But his abstract thinking, for all its power, has not solved his racism — if we can call it that — against the North Bank. If anything, it has solidified and supported his misapprehensions. Sophie may challenge Robick, but through her, The Fever of Urbicande (a thoroughly intellectual work) challenges our own notions of the power of intellectualism. In fact, the story displays the limits of such a narrow, hyper-rational mentality. Any work of fiction should be proud to make such a claim. But for a comic book set in fantastic, imaginary city, such a claim is all the more remarkable. This isn’t simply what comics can achieve. It isn’t even what science-fiction stories can achieve. It’s something fiction in general rarely achieves. On the chapter’s final page, Sophie and Eugen, having left the cafe, continue walking along the top of the North Bank. As has happened before, their conversation seems to continue from between the panels, allowing us to fill in the gaps. She looks away as she says this, as if taking in the sights. He’s also looking away from her, though his face is one of stony concern. They’re standing right next to each other, but they’re mentally far apart. In the final, silent panel that takes up most of the page, the two come together. They sit, smokestacks around them, and stare out at the city of Urbicande, sprawled beneath them. Because the image doesn’t show much of what’s behind them, they seem almost suspended in space, perched at the highest point possible. They’re sitting side by side and holding one another. Yes, Robick’s still bracing himself with his other hand, a subtle hint that perhaps, even in this lovely, intimate moment, he still fears falling. They are different people, with different personalities. But they have never seemed more a couple. One gets the sense that they have gone on a journey that’s challenged Eugen but also proved that he’s willing, albeit with prodding, to try new things and to be the kind of man she needs him to be. One wants to believe that they will grow together, that Eugen will continue to get out of his shell, under her influence. But the future’s uncertain — for them as a couple, as well as for the city sprawled in front of them. There is only this moment, this sublime moment of togetherness, in which two people sit in an amazing place they’ve never been and see their home from a new perspective. And consuming the city before them, reaching higher than any building, is the network that has made this all possible. We knew that the network had grown to enormous proportions, stopping only once it filled the entire city. But we haven’t been able to see it, in anything resembling its totality, for some time. Now that we do, it’s a staggering sight. The city Sophie and Eugen stare down at is one they’ve never seen before. They — and we — are looking at new Urbicande, one changed in radical but inevitable ways by the presence of the network. Yes, the network has caused the government’s totalitarian policies to collapse. Yes, it has permitted people to cross from one bank to the other, allowing people to encounter who have previously existed only in rumor. The network has literally bridged what were once the strongest of divides. But it’s also changed these two lives, in Sophie and Eugen, and perhaps brought them together, just as it has the two banks. It’s a profound and beautiful image of two people, in a quiet moment, coming together to see how much their world has changed. And perhaps, in their silence, to accept it as inevitable, in all its implications. It is cultural. It is architectural. It is philosophical. It is personal. It is romantic. It is beautiful. It is all these things and more, bound tightly together by the story’s interwoven themes. And like all great art, it is transcendent, greater than the sum of its parts, greater than words or intellectual analysis — the limits of which we’ve already seen — can capture. Which is why the panel is silent and I should gush no more about it.